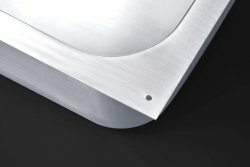 Stainles steel under mount bowls are designed to fit beneath a cutout in an existing or newly-installed work surface made from materials such as Corian, granite, solid wood or Trespa. Each undermount bowl unit features a flat, integral flange, which can be predrilled with fixing holes, if required; with the application of an appropriate sealant during installation. This will provide a watertight seal between the bowl and worktop. Choose from our wide range of prefabricated bowls (see size chart below), which can be supplied in a choice of 304 food grade or 316 laboratory grade steel. Alternatively, order a bespoke piece, to the exact size you require. These custom-made under mount bowls can be fabricated to any internal length and width, plus any depth, up to 450mm. All are made with 32mm radius (curved) internal corners as standard – however, box-style corners can be supplied, if preferred where a more trough style is preferred (see our stainless steel wash troughs for more details). All also feature a 30mm flat flange as standard – again, however, this size can be altered as required for the specific installation. acid-resistant, un-slotted polypropylene waste with upstand waste and overflow tube. 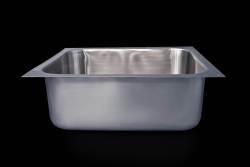 Our stainless-steel, undermount laboratory sink bowls are made from high-quality, 316-grade metal. This steel is highly resistant to harsh chemicals – epoxy resin, by comparison, has been known to crack under contact from certain chemicals – and will also survive regular impact and extremes of heat. Thanks to inbuilt antibacterial properties, it is also ultra-hygienic, making it ideal for environments such as clean rooms, where bacterial control is crucial. Designed for easy fitting beneath a cutout in a work surface made from materials such as Corian or Trespa, these bowls are easy to incorporate into both existing and new installations. We offer a range of prefabricated undermount bowls in various sizes – please see chart. All are supplied with a 30mm flat flange. This can be pre-drilled with fixing holes, to make fitting simple. When combined with sealant, this fixture will provide a watertight finish with the bench top. These bespoke units are a premium model, which will last for decades. We also supply a wide range of other laboratory-specific products, from stainless-steel worktops and cupboards to wash troughs and shower trays and have fabricated all of the storage units and work surfaces for prestigious academic and corporate laboratories. Contact us today, to discuss your requirements. Ideal for mounting beneath a cutout in a worktop fabricated from Corian or Trespa, undermount sink bowls from DSM are made from robust stainless steel. These easy-clean units are impact-resistant and high in antibacterial properties, making them especially suitable for a hospital, clinic or care home, where products need to combine toughness and functionality with high levels of hygiene. We offer undermount bowls in a choice of 304 (food-grade) and 316 (laboratory-grade) steel, and in a variety of sizes. Please refer to our chart, to choose the size and model of prefabricated bowl that is right for your project. Alternatively, if you require a size or model of bowl that is not on our list, our engineers can customise a bowl to your precise specifications. These bespoke items are premium units, which will last for decades. choice of siting of waste holes, to match the installation (for larger units, we recommend rear left/right siting, to ensure good drainage). All of our undermount sink bowls can be supplied with pre-drilled holes, for fixing. When combined with sealant, this method of fitting provides a watertight finish between bowl and work surface. In all cases, we can supply the unit with pre-drilled fixing holes, if required. Once sealant is applied, this will ensure a watertight finish with the worktop. DSM has been supplying stainless-steel products to the healthcare arena for more than half a century. Our range of premium products includes: stainless-steel tables, worktops, cupboards, shelves, sinks, vanity tops, urinals and shower trays. Contact us today, to discuss the furnishing needs of your hospital, clinic or care home. Whether you are installing a new classroom or laboratory, or need a sink bowl to fit into an existing set-up, DSM’s stainless-steel undermount sink bowls are a neat option. Easy to fit beneath a cutout in a worktop made from Trespa, Corian, solid wood or stone, the undermount design takes up less room than a standard sink unit, making it particularly appropriate for a classroom or nursery where space may be at a premium. It is also the ideal choice in instances where the work surface already contains grooves for drainage. The steel’s naturally-occurring antibacterial properties make it easy to maintain a high level of hygiene, be the situation a kitchen, a preschool, a food science room or a laboratory. We offer a wide range of prefabricated undermount bowls, in a choice of 304- or 316-grade steel. Please consult the chart for the sizes available. For areas where a specific application or situation dictates the need for a bespoke unit, opt for one of our made-to-order bowls. Again, available in both 304- and 316-grade metal, these undermount sink bowls are made from premium sheet steel and are so highly finished, they will last for decades, retaining their sheen with only the minimum of upkeep. Both bespoke and prefabricated bowls come with the option of pre-drilled fixing holes, which, once combined with the appropriate sealant, will provide a watertight finish between bowl and work surface. As well as undermount bowls, we offer shower trays, wash troughs, cupboards, shelves and many other high-quality products in stainless steel, all ideally suited to the academic sector. Get in touch today, to discuss how DSM can fabricate and supply the items you need, for your institution. Designed for fixing beneath a cutout in a work surface, stainless-steel undermount sink bowls from DSM are a neat, hygienic way to fit an additional sink bowl into an existing or newly-installed kitchen. With the natural antibacterial properties of stainless steel – and its easy-clean surface – our bowls are an ideal complement to a catering environment. Available in a variety of prefabricated sizes (please see size chart), they can also be ordered as bespoke items, should a specific size or shape of unit be required. Our bespoke undermount sink bowls are highly finished; made from premium sheet metal, they will last for decades. Choose between the standard, 32mm radius corners or box-style corners; you can also order the standard, 30mm flat flange, or a specific-size flange, to match your installation. Further choices include: your specification of length and width of unit, plus any depth, up to 450mm. Waste holes can be positioned where required (although we do recommend rear right or left siting, in larger bowls, to ensure adequate drainage). With both the bespoke and prefabricated sink bowls, we offer the option of pre-drilled fixing holes in the flange. Once sealant is applied, this will provide a watertight finish between the bowl and counter top. DSM has more than fifty years’ experience of supplying stainless-steel products to the catering arena. We offer a wide range of items, from worktops and cupboards to a variety of sinks and hand-wash basins. Get in touch today, to find out how we can apply our experience and expertise to your project. Combining streamlined aesthetics with functionality, DSM’s undermount sink bowls are ideal for use in both public and private washrooms. Whether a new bowl is needed in an existing worktop or a new counter is being installed, a stainless-steel undermount bowl from DSM will pair neatly with a work surface made from Trespa, Corian or solid wood. Simply fix the bowl beneath a cutout in the worktop. We can pre-drill holes into the unit’s flange, for ease of fitting; once sealant has been applied, this will provide a watertight seal between bowl and counter top. We offer a range of sizes of prefabricated undermount units: please consult our chart. Alternatively, for a tricky shape or awkward size of installation, consider a bespoke bowl: we can fabricate these premium items to the exact width and length required, and to any depth, up to 450mm. standard, 30mm flange – or a size of your choice. Our range of items for washrooms also features a number of hand-wash basins, plus wash troughs, vanity tops, urinals and shower trays. We can also supply bespoke stainless-steel worktops, and cupboards, shelves and drawers – all in our premium stainless steel, which features ultimate antibacterial properties. Contact us today, to discuss your washroom requirements. Perfect for the modern kitchen, stainless-steel undermount sink bowls from DSM are designed to fit neatly beneath a cutout in a work surface made from solid wood or stone. Our food-grade stainless steel is the ultimate material for maintaining domestic hygiene: it not only contains naturally antibacterial properties, but it is also very easy to keep clean. 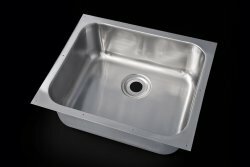 We can supply a wide range of prefabricated sink bowls – please refer to the size chart. 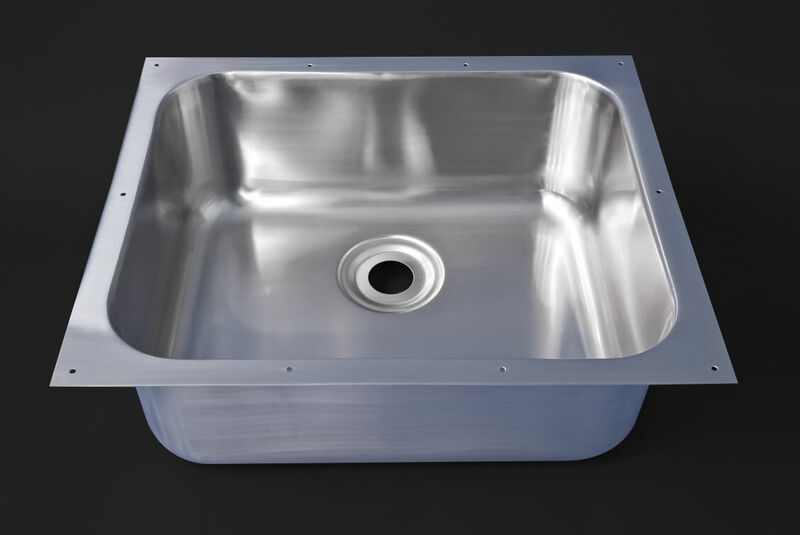 However, where exact sizing is tricky, we offer a bespoke service, whereby we can fabricate a bowl to the precise height, width and depth (up to 450mm) that you require. Our bespoke bowls are made from premium steel. This ultra-gleaming material will keep its sheen and shape for decades, standing up to the daily knocks of a domestic kitchen with only the minimum of upkeep. For a professional finish to a prefabricated or bespoke bowl, opt for pre-drilled screw holes in the bowl’s flange – with the application of the right sealant, this will be all you need to create a watertight seal between the bowl and the worktop. Undermount sink bowls are part of DSM’s wide range of contemporary products for the modern interior. Consider incorporating stainless-steel cupboards, shelving, worktops and shower trays – all made from high-quality, food-grade metal, which will last for decades. Get in touch today, to discuss your plans for your home. Whether you are renovating your veterinary practice, or just need a new sink bowl to set in to an existing worktop, DSM’s sturdy, stainless-steel undermount sink bowls are the ideal solution. Designed to fit neatly beneath a cutout in a worktop made from Trespa, solid wood or stone, they are robust and stain-resistant, and offer a high level of resistance to bacteria. We offer a wide variety of sizes in our prefabricated bowls – please see our size chart for details. All can be produced in a choice of 304- or 316-grade steel – the latter being ideal for applications involving harsh chemicals. All feature an integral, flat flange, which can be pre-drilled with fixing holes, if required, for ease of fitting, and to provide a watertight finish with the worktop (when combined with sealant). Alternatively, where a non-uniform size or shape of bowl is required, opt for a bespoke model. Fabricated from premium sheet steel, in either 304- or 316-grade steel, these units offer the strongest, most durable, highly finished design on the market. choice of siting of waste holes (though rear left/right siting is recommended for larger bowl sizes, to ensure adequate egress of water). Contact us today, to discuss your requirements. We also supply a number of other products for veterinary practices, including: worktops, wash troughs, sinks, hand-wash basins and shower trays. We can also create unique, one-off items to order, if you have a specific need.